Representatives from Holyhead Marine Services and Amgram travelled to Belfast this week to carry out inclining trials on HMS caroline. 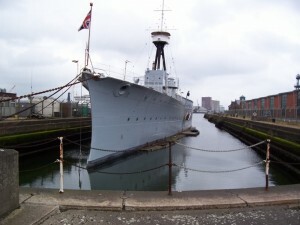 Launched and commissioned in 1914 HMS Caroline is the second oldest ship in RN service. She is the last remaining British World War One light cruiser in service, and the last survivor of the Battle of Jutland still afloat. She now acts as a static headquarters for the Royal Naval Reserve although it is due to be decomissioned in the coming weeks.